We are here! After a year of planning, we got off the plane in Warsaw this morning at 10:25 am. Our incredible guide Graznya was at the airport holding up a sign and was greeted with a hug and a kiss from my mom & I. Whirlwind! Our few hours in a moment, first, the meaning of the title. We arrive in terminal 5 in Chicago and had an hour to kill before we could check in at LOT. We have one choice which was the food court filled with Asian kids. We sat next to this guy and girl and my mom noticed he was wearing a star of David. The friendly Midwestern girl I am starts conversation and the normal stuff like, “where are u from and are you Jewish”. He says, “hong kong and no he is not Jewish”. I asked why he wears a star. He responds, ” I don’t know, it doesn’t mean anything”. 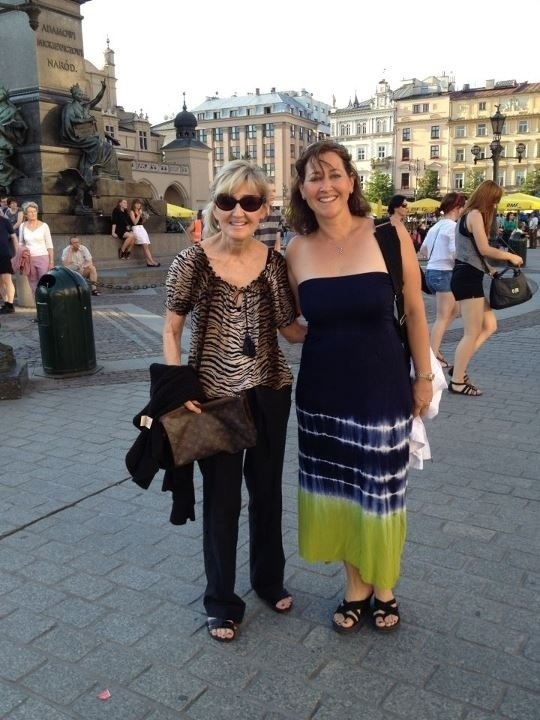 Fast forward 10 hrs to walking around the Warsaw Ghetto. 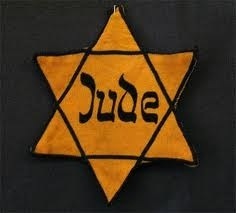 A star meant life or death for the 450,000 Jews herded into the walled ghetto then off to the gas chambers of Triblinka. Warsaw was beautiful. They have restored a lot of architecture that was bombed out by the war. I think Grazyna said that 60% of the city was destroyed. We passed a beautiful opera house that she said the facade is original but the back was destroyed as the Nazi’s used that building for executions. The weather today is perfect. 80 and sunny. Tons of Euro 2012 fans are walking the streets getting ready to go to or celebrate in the Fanzone. The city is alive and playful. We are now on a high speed train to Krakow where we will spend the next two days. Tomorrow will be aushwitz and the a salt mines. Monday will be touring the Wawel castle, Jewish neighborhood of Kazimierz and the Schindler factory . If this is a sign of things to come the blog will be amazing! Beth, I am so excited for you and your Mom to be able to be there and take that journey together. It is so beautiful there. Please eat some amazing Polish yummy ice cream for me. It is 103 today in the desert. Beth, I am so glad to find this post! I saw your pictures on fb and I think those exercise trips might come in handy! I have so much to tell you when we can connect so you be safe!